Bendix 4WD/SUV pads are designed for extreme conditions using application specific materials to suit a huge range of 4WDs, all wheel drives and SUVs. We test them to breaking point under laboratory conditions, simulating the sort of extreme conditions that most 4WDs/SUVs will probably never see. Bendix 4WD/SUV pads are manufactured for extreme strength and structural integrity utilising the best available technology. Bendix 4WD/SUV brake pads are built to withstand heat build-up that comes from frequent braking in heavy city traffic one day and towing or outback driving the next. The new Bendix Blue Titanium Stripe is another improvement in brake technology developed by the Bendix engineer. The Blue Titanium Stripe adds a new level of stopping power straight out of the box. The original Titanium Stripe eliminated the need for bedding-in Bendix brakes saving you time and money, now the new Blue Titanium Stripe goes even further, lasting longer and creating the ideal brake pad and rotor surface to give better braking performance right after fitting. 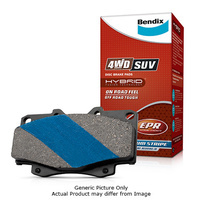 Bendix 4WD/SUV brake pads are specially formulated to match specific vehicle types. For heavy 4WDs, the formulation is designed for durability and confident braking especially when loaded up or traversing serious off road terrain. For SUVs and ‘soft road’ models, the formulation is specifically designed for low noise and low dust. 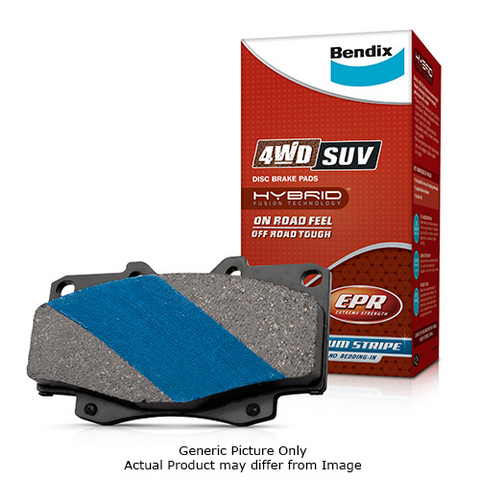 Bendix 4WD/SUV pads have been developed for optimum performance, no matter what you drive. More than 100 references available, covering the majority of 4WD, all wheel drive and SUV vehicles.